BEIJING -- U.S. Secretary of State Rex Tillerson acknowledged on Saturday that the United State is maintaining direct channels of communications with North Korea even as tensions rise over the North's nuclear and missile programs and the countries' leaders spar through bellicose name-calling. Tillerson said the U.S. was probing North Korea's willingness to talk, and called for a calming of the situation on the Korean Peninsula, adding it was incumbent on the North to halt the missile launches. "We have lines of communication to Pyongyang. We're not in a dark situation, a blackout," Tillerson told reporters during a visit to China. "We have a couple ... three channels open to Pyongyang. We can talk to them, we do talk to them." No elaboration about those channels or the substance of any discussions came from Tillerson, who met with Chinese President Xi Jinping and other top officials in Beijing. Since President Donald Trump took office in January, the U.S. has restored a diplomatic back-channel between the State Department and North Korea's mission at the United Nations. That's traditionally been a way for the two sides to communicate because they lack formal diplomatic ties. The main aim of the initial contacts was to seek the freedom of several American citizens imprisoned in North Korea, although U.S. officials have told The Associated Press that there were broader discussions about U.S.-North Korean relations. Those contacts, however, have failed to reduce the deep mistrust between the adversaries and it's unclear to what extent they have endured the current spike in tensions. North Korea has in recent months tested long-range missiles that potentially could reach the U.S., and on Sept. 3 conducted its largest nuclear test explosion to date. The standoff has entered a new, more dangerous phase since then as North Korean leader Kim Jong Un and Trump have exchanged personal insults and threats of war. "I think the most immediate action that we need is to calm things down," Tillerson said. "They're a little overheated right now. And I think we need to calm them down first." He did not directly address the impact of Trump's own rhetoric. "Obviously it would help if North Korea would stop firing off missiles. That would calm things down a lot," Tillerson said. Trump gave a combative speech recently at the U.N. General Assembly in which he mocked Kim as "Rocket Man" on a "suicide mission." Trump said that if "forced to defend itself or its allies, we will have no choice but to totally destroy North Korea." Kim responded by saying he would "tame the mentally deranged U.S. dotard with fire." Tillerson's stop in the Chinese capital was helping lay the groundwork for a November state visit by Trump, part of a five-nation swing through Asia. Trump has pressed for sterner measures against the North by China, the North's chief trading partner and source of aid and diplomatic support. Beijing adamantly opposes steps that could bring down Kim's government, but appears increasingly willing to tighten the screws. China has agreed to tough new U.N. penalties that would substantially cut foreign revenue for the isolated North. On Thursday, Beijing ordered North Korean-owned businesses and ventures with Chinese partners to close by early January, days after it said it would cut off gas and limit shipments of refined petroleum products, effective Jan. 1. China made no mention of crude oil, which makes up the bulk of Chinese energy supplies to North Korea and is not covered by U.N. sanctions. China has banned imports of North Korean coal, iron and lead ore, and seafood since early September. Still, Washington hopes China will exert even greater pressure. China argues that sanctions alone cannot solve the impasse, and has urged Washington to cool its rhetoric and open a dialogue with North Korea. But the North is coming closer to having a nuclear-tipped missile that could strike America, and says it will only discuss the weapons programs if the U.S. abandons its "hostile policy" toward the North. Tillerson affirmed that the U.S. would not recognize North Korea as a nuclear power, while saying the Trump administration had no intention of trying to oust Kim. This was Tillerson's second visit to China as America's top diplomat. China is the world's No. 2 economy and chief U.S. rival for influence in Asia, and increasingly, the world. In addition to North Korea, the U.S. and China have other security concerns to address. They are at odds over Beijing's military buildup and assertive claims to disputed islands in the South China Sea. Trump is also looking to reduce China's massive trade surplus with the U.S. - $347 billion last year - and what American companies say are unfair barriers to investment, including pressure to hand over their technology. 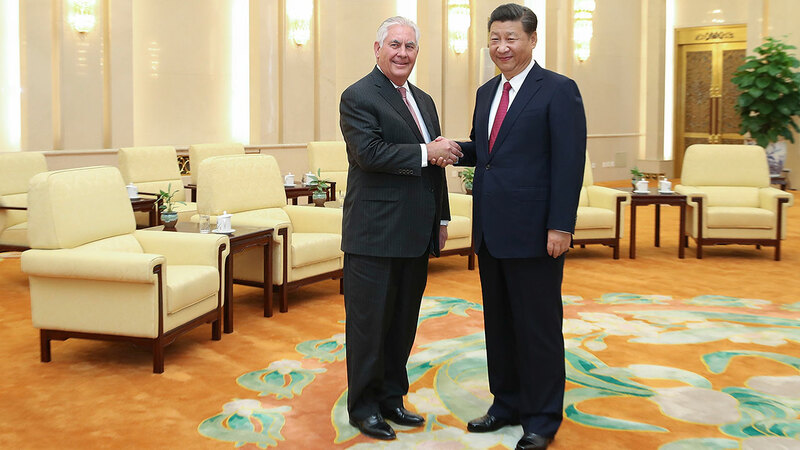 In opening remarks at his meeting with Xi, Tillerson said relations between the sides continue to "grow and mature on the strength of the relationship between yourself and President Trump." He added: "We look forward to advancing that relationship at the upcoming summit." Trump and Xi met in April at Trump's estate in Florida. Trump's planned visit next month will come weeks after Xi is expected to receive a new five-year term as leader of the ruling Communist Party. The presidents' upcoming meeting promises to be grander and more choreographed than the informal talks in Florida that were most memorable for Trump's ordering a missile strike on Syria and then informing Xi about it afterward as they ate chocolate cake. Pennington reported from Washington. Associated Press writer Joe McDonald contributed to this report.